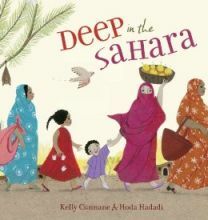 Deep in the Sahara by Kelly Cunnane tells the story of Lalla, a young girl living in the Islamic Republic of Mauritania in northwest Africa. In Mauritania many adult women wear a veil known as the malafa, and more than anything, Lalla wants to wear one as well. The book tells the story of her trying to convince her female family members to let her do so. This is an important book in that it gives a nuanced picture of the meanings of veiling and introduces children to a little-known part of the world. Throughout the book, Lalla names all of the reasons that she wants to wear a malafa, including its beauty, mystery, association with being an adult, and connection to tradition. The women who she speaks to remind her that there is more to the malafa than this. Finally, Lalla tells her mother that she would like to wear the malafa so that she can pray like she does. By understanding the connection of this veil to her Muslim faith, Lalla is able to join the ranks of the older women in wearing one. This is Cunnane’s first book that is set in the Sahara, although she has written several children’s books that take place in East Africa, including For You Are a Kenyan Child, which won the Ezra Jack Keats New Writer Award (for another view of For You Are a Kenyan Child see Herine Ogutha’s review http://africaaccessreview.org/aar/detail.aspx?r=1673). The book has several important messages about the complexity of clothing and Muslim dress. Lalla explores a variety of meanings of the malafa — it is beautiful, traditional, and so on — and children might use this as a model to think about the different meanings of the clothes they wear. Most importantly, the book offers a relatively nuanced view of the meaning of veiling. While in the U.S. media veiling practices are often shown as oppressing women, here Cunnane introduces the idea that, while the malafa is intimately linked to the characters’ Muslim identities, it is more than this as well. Illustrator Hoda Hadadi’s bright, lively collages do a good job of capturing the brilliant colors and loud patterns that often characterize malafas, thus also expanding children’s understanding of veiling beyond the drab images of Muslim women that are often shown on television. Hadadi depicts her characters as happy and shows that, while they wear similar garments, they are individuals by making each face unique and varying how they wear the malafa. There is also a helpful author’s note at the end of the book which provides some context as well as a glossary that defines the Hassaniya words that Cunnane uses which children would enjoy learning. While the book takes good steps in complicating understandings of veiling, it also continues to reproduce some stereotypes about Muslim women, their dress, and Africa. Despite the fact that many Mauritanian women work outside of the home, the women in the book are portrayed conducting domestic work or shopping in the market, suggesting that they primarily carry out traditional roles as mothers and housewives. Furthermore, the meanings that Lalla and the other female characters attribute to the malafa — that it is beautiful, mysterious, womanly, and traditional — also send a message that this garment is exotic and tied to the past. While these are some of the meanings of the malafa, Mauritanian women also speak about its connections with global fashion, discuss which fabrics are best for going to the office, and note how wearing the malafa helps them to feel empowered. Finally, the illustrations are devoid of modern technology — no cars, cell phones, televisions, or refrigerators are depicted even though many of these items are now ubiquitous in even the most rural of Mauritanian villages. Together, this portrayal of women and the setting implies that Mauritania women as well as the country itself are isolated and disconnected from the modern world. Such views are common in discourse about both Africa and Muslim women in the United States and it is too bad that this book sends this message as well. Overall, the book is important in that it provides a nuanced view of veiling and introduces children to the bright, colorful veils that women wear in Mauritania. It could serve as a useful departure for discussions on Islam. Teachers or parents could pair reading it with showing photographs of Nouakchott, the capital city where Cunnane lived teaching English for a year, to help students understand that Mauritania is not an isolated place and that, like women in the United States, many women there balance work and family. Deep in the Sahara | Reading is Magic!